Snazz up your wedding dress with accessories worthy of the occasion. Soft shades of blue, glittering accessories, and opal crystal hair jewelry are making a splash in the world of weddings. Enhance your wedding day look with sumptuous beauty. A graceful rhinestone and crystal halo encircles your locks with stunning shimmer. This design pairs perfectly with opal crystal jewelry for an entirely magical ensemble. 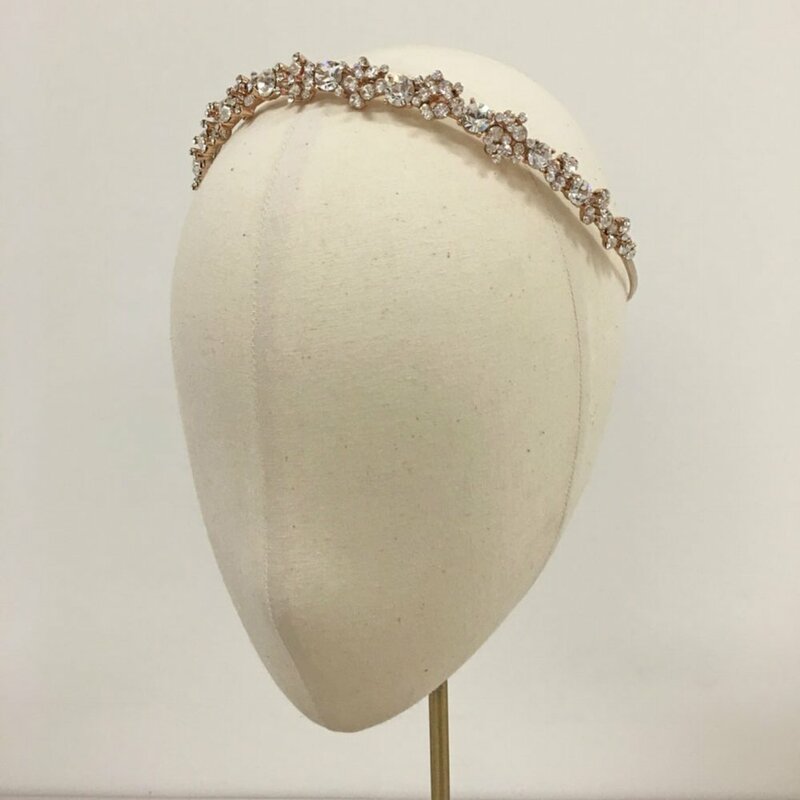 Make a dramatic statement with a bold headband composed of shimmering opal crystals and twinkling rhinestones. Marquise, oval, and teardrop stones create a decadent floral motif that enhances your bridal hairstyle with gorgeous sparkle. Pair this piece with glamorous jewelry to complete your look. Complete your ensemble with a beautiful opal crystal and rhinestone link bracelet. Glittering round and oval rhinestones bring graceful glamour to your wedding day look. Jazz up your hairstyle with a glorious opal crystal and rhinestone comb. Bold stones in a floral pattern add artistic sparkle to your bridal tresses. Love this piece alone or with a veil for an elegant, fashion-forward look. 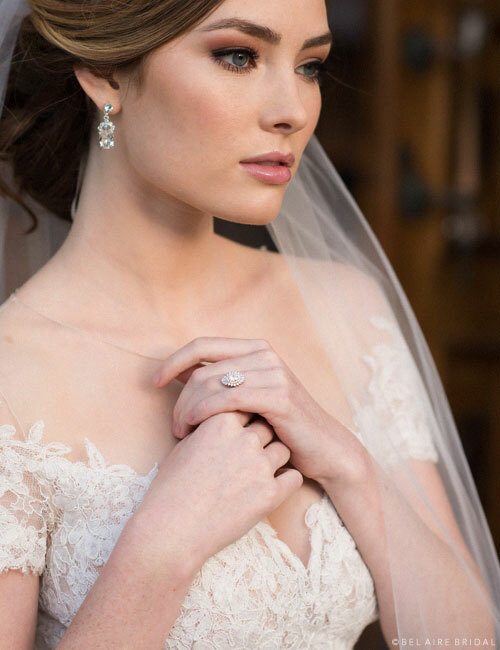 Enhance your bridal look with a dash of sparkle. Large oval rhinestones in a vintage-inspired setting create a unique accent for your ensemble. Weave a garland of wired opal crystals and clear rhinestones into your wedding day hairstyle for a light touch of elegant beauty. You'll feel naturally gorgeous wearing this delicate, sparkling hair vine. Pair it with an embellished veil to finish off your look. Enjoy a pretty pair of sparkling opal and rhinestone pins! Delicate hairsticks featuring round rhinestones, wired opals, and crystal beads create a dazzling accent for your bridal hairstyle. These also make a lovely gift for your bridesmaids (two included in a set). 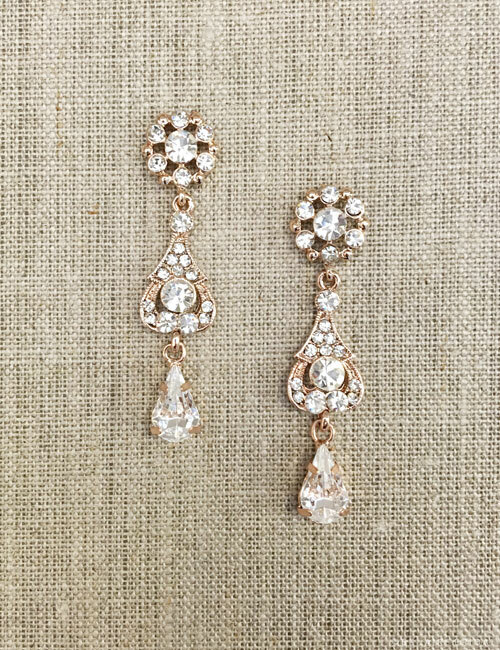 Add the perfect touch of sparkle to your bridal ensemble. A pair of pretty rhinestone flower studs brings subtle beauty to your look and delicately complements your other accessories. Glistening like dewdrops gracing a field of flowers on a sunny, spring morning, this glorious comb combines rhinestone flowers, curling leaves, and precious pearls for stunning, nature-inspired elegance! Pairs perfectly with embroidered veils and pearl jewelry to complete a look of fresh, blushworthy beauty. Crown your special day with an opulent tiara crafted with stately loops and swirls! Sparkling with round cut and baguette rhinestones, this legendary beauty evokes Old World grace and courtly elegance. Draw attention in regal style by matching sparkling earrings and a glamorous veil! Sparkling with gorgeous vintage-inspired design, a pavé frame holds a glittering round rhinestone with a suspended teardrop shimmering below. Beautiful with or without a necklace, this lovely pair attaches with rhinestone-studded posts. Sparkle with radiant beauty on your special day with a gorgeous rhinestone and filigree halo! This delicate design of shimmering links creates a look of easy-going elegance and is charming for both indoor and outdoor weddings. Diamonds go with a wedding like frosting on a cake! Enrich your tresses by selecting this gorgeous rhinestone contour tiara! Framing your beauty with radiant sparkle, you'll love the shimmer by day or candlelight! Commemorate a love that will last forever with a gorgeous infinity bracelet sparkling with rhinestone. Classically beautiful, you'll love the elegance and symbolism of this heartfelt keepsake. Wear it on anniversaries for years to come! Silver toggle clasp. Shimmering with delicate silver loops and leafy rhinestone details, this intricate vintage-inspired comb lavishes your locks with bridal beauty. Secure your hairstyle and steal his heart with this delightfully dainty accent. Sparkle your way down the aisle wearing glittering hair jewelry! This rhinestone tie headband or belt creates a lovely accent for your bridal ensemble. Exquisite marquise and round stones lend this piece a fabulous vintage vibe. Generously encrusted loops of pavé rhinestones surround teardrop stones for classic elegance. This sumptuous, textured pair infuses your photos with glamour! Inverted pear posts trail starry ovals down to opulent drop rhinestones for gorgeous elegance. Perfect for a glamorous wedding! Embellish your bridal ensemble with gorgeous bling! A sumptuous design of swirling, old-fashioned filigree and sparkling round rhinestones circles your hair in a beautiful halo. This vintage-inspired piece is lovely with or without a veil. Evoke the sprightly beauty of nature with a glorious headband of tiny flowers. Delicate floral sprays with sparkling rhinestones make you shine with feminine elegance. Pair this nature-inspired piece with other floral designs for a sweetly romantic ensemble. Embrace nature-inspired beauty with a pretty floral halo. This metallic flower design blooms everlasting and sparkles with dazzling rhinestones. Add feminine jewelry for a blissfully radiant ensemble. Enhance your hairstyle for a seasonal wedding with this gorgeous clip composed of swirling silver or gold leaves. Evoking the beauty of nature with stunning artistry and sparkle, this elegant accessory pairs perfectly with silver, gold, or rhinestone jewelry. Boho-chic and utterly fabulous, a clip of delicately wired metal leaves and shimmering rhinestones curls through your hair. Lovely for a summer or autumn celebration, this flexible clip gives your hairstyle a personalized look. Accent your bridal hairstyle with a beautiful metallic leaf and rhinestone comb. This lovely design adds elegant, nature-inspired charm to your look. Pair it with dainty rhinestone accessories in silver or gold for an especially sparkly ensemble. Enrich your bridal ensemble with a beautiful weaving garland. Rhinestone clusters, sparkling chains, gilded leaves, and tiny metal flowers create a gorgeous accent. This lovely design secures with metallic ribbon ties and may be worn with or without a veil. Nestle an enchanting bridal clip into your locks. This twirling design features glittering, rhinestone-encrusted leaves and pearl accents. Slip it into a chignon or wear it on the side for subtle sparkle. Crown your hair with eternal flowers. Blooming with exquisite beauty, a metallic floral garland glitters with rhinestone accents and freshwater pearl sprays. This lustrous, nature-inspired design pairs perfectly with gold or silver accessories. Harness the warmth and beauty of nature wearing a flexible metallic tie headband. Featuring a design of open leaves, this pearl-packed design shimmers with lustrous elegance. Adorn your bridal locks with a romantic comb of metallic flowers. 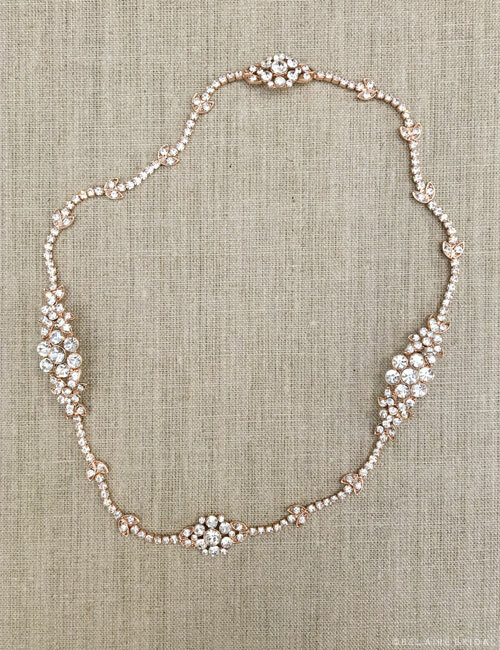 Lustrous petals, wired pearls, clear crystals, and sparkling rhinestones create a look of fairy-tale beauty. This pretty bohemian accent enhances any gown with floral details.